It's a well known fact in my family that I hate/fear/loathe spiders. I hate their legs, their webs, and the way they scuttle around, jump at you, or drop unexpectedly on your neck or head. (Excuse me a minute while I slap repeatedly at my head and neck because that creepy feeling I got just now might have been a spider.) I know they have their place in the grand design of the universe, but my place in that same design happens to be standing over them with a heavy shoe poised for the kill. But that's only if no one else is in the house. If my husband is home, then he's the one to gallantly spring to action when he hears my piteous shrieks of terror. He'll calmly take a piece of tissue and squish the spider (with his bare hands!) and toss it into the toilet, which I hurriedly flush, just in case that spider's planning a comeback. It would surprise my family to know I have an uneasy relationship with a spider in my laundry room. This is not the kind of relationship where I name the spider an endearing name, become attached to it, and it weaves messages to me in it's web. No, we have an agreement. The agreement goes something like this: I promise to not hunt him down in his hidey hole next to the washing machine as long as he traps and consumes the other bugs that lurk in there, keeps the webbing to a minimum, and does not show his creepy legs during daylight hours. When I stretch the terms of the agreement and go into the laundry room at 5:00 am, it is his responsibility to scuttle out of sight and it's my part of the bargain to pretend I don't see him. If he chooses to linger, a quick, squashy death brought about by my shoe or the nearest heavy, hurlable object is in his immediate future. This might sound harsh, but I don't waste time being sentimental with spiders. I either shriek, throw, or stomp, all the while hyperventilating. I figure I'm showing great restraint in not asking my husband to introduce Mr. Spider to Death By ShopVac. Oh, crud - I just named him! What's next? Allowing his webs to stay up, festooning the laundry room with cobwebs filled with dryer lint? Looking for cryptic messages in those webs? Opening the window to purposefully allow flies to come in so he won't starve? Spending my time in the laundry room talking to him?? No, this must stop right now. I'm going to march down there and put an end to this weird, permissively symbiotic relationship. With a shoe. Which is in my closet. Which I can't get to without waking up my husband. Hmmmm. Mr. Spider is looking pretty big these days, approaching the size of a Smart car. Maybe I'll just wait for my husband to wake up and let him deal with Mr. Spider. And while I'm waiting, I'll bake up a batch of attaboy treats. Muffins. A terrific way to start the day! Plus, since they're grain-free and contain no sugars, they won't spike your blood sugar and leave you feeling lethargic and groggy, which you absolutely shouldn't be if you're going to do battle with spiders! 2-In a large bowl, combine the almond meal, salt, and baking soda. 3- In a medium bowl, whisk together the olive oil and eggs. Stir the wet ingredients into the almond meal mixture until thoroughly combined. Stir in the bananas, then fold in the blueberries. 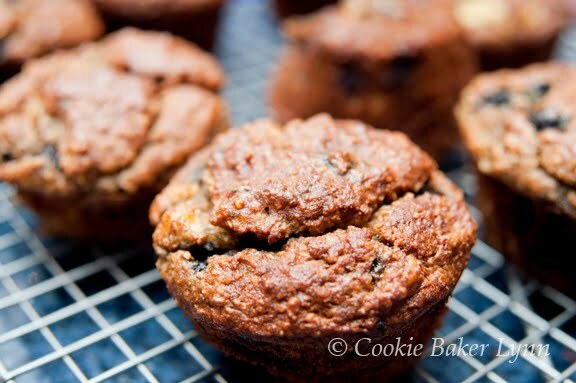 Using a large spoon or scoop, divide the dough between the muffin cups. 4- Bake for 35 to 40 minutes, until the tops are golden brown and a toothpick inserted into the middle of a muffin comes out clean. 5- Set the muffin tin on a wire cooling rack and let the muffins cool in the pan for 30 minutes, then serve. Preferably with lots of good butter! 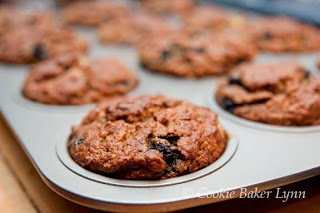 Muffins look yummy..thanks for posting. bananas are just an awesome baking ingredient! Hi Lynn, I was happy to find your blog from Simple Bites-- I live in the same area as you. I am more of a cook than a baker but I just bought my first blanched almond meal lately (from Champion Grocery Outlet) and am looking forward to making something with it-- these muffins look really good, and healthy.